At Mattei, we understand no product is truly "one-size-fits-all" so we often design and develop custom compressed air solutions in order to meet our customers' unique needs. You can read about one such instance in our latest case study featuring Transwest. Since the 1980s, Transwest has provided transportation products and services for heavy- and medium-duty trucks and trailers, cars, SUVs, RVs and more. 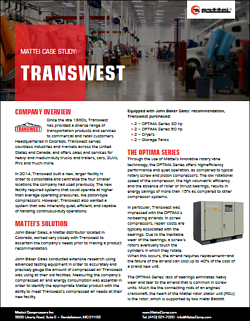 Recently, Transwest chose Mattei to find a new and more efficient compressed air solution for its largest facility in Colorado. To access the full case study, please complete the form to the right.